In most of Europe, crafts and professions had been governed by guilds for centuries, ever since the expansion of towns and cities in the early Middle Ages. These sworn associations controlled trade, limited outside competition, established standards of quality, and set rules for the training of apprentices. Membership was usually compulsory—only guild members could practice their trades within a city and its territory. Most guilds originated as religious organizations. They continued to serve a social and religious function, organizing celebrations on feast days, sponsoring lay brotherhoods, and providing charitable support to the widows and families of their members. In the 1200s, Florentine painters had joined the Arte dei Medici e Speziali, the guild of physicians, apothecaries, and spice merchants. Their association with these professions is not as improbable as it may at first seem, since apothecaries and spice dealers were suppliers of pigments. Painters and doctors also shared a patron saint—Luke, who was himself both a doctor and an artist (and said to have painted the Virgin and Child from life). Goldsmiths and those who worked with gold thread belonged to the Arte della Seta, together with silk workers. Sculptors and carpenters were members of the Arte dei Maestri di Pietra e Legname. Architects did not have a guild per se. Most architects also worked in other arts; many worked primarily as sculptors, as we have seen. 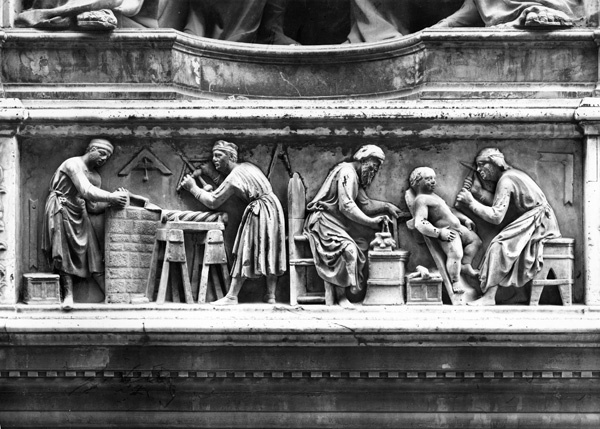 This relief showing sculptors at work was part of a commission from the guild of sculptors and wood-carvers in Florence. It formed the base for a group of four monumental figures set in one of the niches at Orsanmichele, where each of the various guilds placed a statue of its patron saint(s). The figures in this relief, like the statues that stood above them (also carved by Nanni di Banco), represent the Four Crowned Martyrs. According to medieval legend, these four masons living in the time of Diocletian had refused to carve a pagan statue. By the end of the thirteenth century the Medici e Speziali also included barbers, glassblowers, booksellers, potters, and makers of all manner of items, from knives to masks to tennis balls and racquets. As the status of artists rose, the old associations with manual crafts and trades came to be viewed as stifling to artists’ professional aspirations. During the early fourteenth century, Florence’s painters won limited independence from the guild to form the Company of Saint Luke, an association that originated and continued to function as a religious confraternity. Although it was initially founded for painters, its membership was not restricted; early rosters also list tailors, cheese makers, gold beaters, and a few women—people who perhaps had a particular devotion to the saint. Somewhat later, sculptors were also admitted. That sculptors and painters saw their interests as united, and distinct from other trades represented in their guilds, suggests a new perception about the arts. Although workshop training would continue more or less unchanged throughout the Renaissance, artists increasingly saw themselves as practitioners of a liberal art. New institutions evolved that reflected this transformation and helped promote it.